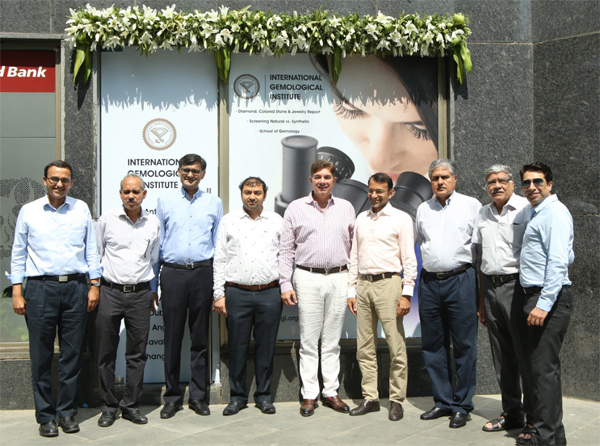 The International Gemological Institute (IGI), the world's largest independent gemological institute, announced the October 16th, 2018 opening of a new facility in Mumbai at the Bharat Diamond Bourse. Located at Tower FW in the exchange, the space will serve as a welcomed extension of IGI's existing laboratory services in the capital city, operating as a full-fledged sorting and screening facility. Streamlining the evaluation process, trade personnel will also be able to drop their parcels at the fully operational office from 9 a.m. to 6 p.m. and collect them once the certification process is complete. Anoop Mehta, president of the Bharat Diamond Bourse led the inauguration alongside Mehul Shah, vice president, Bharat Diamond Bourse; Ashish Mehta, partner, Kantilal Chotalal; Sanjay Kothari, chairman, GJSCI; Rajesh Lakhani, director, Kiran Gems; and Milan Parekh of Mahendra Brothers. "We are very pleased to be offering our services at such a key location," said Ramit Kapur, general manager, IGI India. "Our new facility features the latest identification equipment, enabling us to address the trade's queries pertaining to synthetic diamonds, which is a vital need as of late." "The goal of the facility at the bourse is to help diamond producers experience a quicker and more efficient certification process with IGI," said Tehmasp Printer, managing director, IGI India. "With real-time screening, trade professionals can now have their melee parcels checked for contamination of synthetic diamonds, if any. As a trusted independent gemological institute, we are honored to continue to provide these beneficial services for the bustling jewelry industry in Mumbai." For more information on IGI and its offerings, please visit www.igi.org.